The Battleship New Jersey is now permanently berthed on the Delaware River in Camden, NJ, directly across the river from Penn's Landing. She was officially opened to the public as a museum on October 15, 2001. Her final berth is just a little over a mile from the former Philadelphia Naval Shipyard where she was originally launched on December 7, 1942. From Birth to Berth, that was the Home Port Alliance's motto, and it has finally become a reality. Welcome Home Big J! Ship closed, however Overnight Encampments, Group Tours, Education Programs, and Event & Meeting Spaces are always available if requested in advance. To schedule an event or Group Tour, call (866) 877-6262 ext. 144. * The Battleship will be open for tours from 9:30 am to 3:00 pm on Veterans Day, Wednesday, Nov. 11th; Black Friday, Nov. 27th: and the week between Christmas and New Year�s Eve: Saturday, Dec. 26th - Thursday, Dec. 31st. Overnight Encampments, Group Tours, Education Programs, and Event & Meeting Spaces are always available if requested in advance. To schedule an event or Group Tour, call (866) 877-6262 ext. 144. All Tour Routes onboard are color coded and marked either Red , Green , or Blue . After completing one of these three tour routes all visitors can then follow a Yellow marked Tour Route which takes them through the onboard museum displays and down below to the ships Galley, Barber Shop, Laundry and Brig. Tickets for all tours may be purchased in advance by calling (866) 877-6262, ext. 108, during regular business hours, or anytime online at ticketweb.com. General Quarters Audio Tour (Self-Guided Audio Tour) Admission Prices - The General Quarters Audio Tour allows guests to take a self-guided tour of our nation's largest battleship and hear sound effects of the ship at sea and in battle, listen to real accounts of life aboard the Big J from former crew members, and even includes music! Now available for adults and children! Tickets are $18.50 for adults; $14.00 for senior citizens and veterans with identification; $14.00 for children 6 - 11 years old. Children under 6 years old, active members of the military in uniform and BB-62 veterans are admitted free. Firepower Tour (Docent Lead Tour) Admission Prices - This Tour is a Docent Lead Tour that takes you to all the places the General Quarters Audio Tour goes, plus a few other areas including the ships Combat Engagement Center where her modern missile systems are controlled from. Tickets are $21.95 for adults; $17.00 for senior citizens and veterans with identification; $17.00 for children 6 - 11 years old. Children under 6 years old, active members of the military in uniform and BB-62 veterans are admitted free. City at Sea Tour (Docent Lead Tour) Admission Prices - This Tour is a Docent Lead Tour that allows guests to visit newly opened spaces onboard the battleship including the Quick Shop, Sick Bay, Dental spaces, Post Office, Machine Shop, Helicopter Control Tower, Ships CCTV Station and other areas. Tickets are $21.95 for adults; $17.00 for senior citizens and veterans with identification; $17.00 for children 6 - 11 years old. Children under 6 years old, active members of the military in uniform and BB-62 veterans are admitted free. Group Tours - Group Tours of the ship can be arranged in advance at special group rates. For more information on scheduling group tours call (856) 966-1652, ext. 145 or send an e-mail to groups@battleshipnewjersey.org. 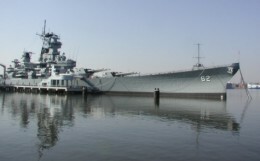 Overnight Encampments / Educational Programs - Your group can spend a night aboard the Battleship New Jersey! The Overnight Encampment program features dinner and breakfast served from the Crew's Mess, a ride in the 4D Flight Simulator, a tour of the ship, and a chance to sleep in the bunks where the crew of the battleship once slept. Reserve your bunk today! Group Encampments are available for Boy Scouts, Girl Scouts, and also for VFW, military reunions and other adult groups. Menu upgrades, team-building programs, entertainment and more can also be provided. The price per person for an encampment is $54.95. Group encampments must be scheduled in advance, for more information on scheduling an encampment or educational program call (866) 877-6262, ext. 203 or send an e-mail to overnights@battleshipnewjersey.org. Special Events - Several areas of the ship are available for special events. These areas can accommodate from 15 - 20 people (Admiral's Cabin) up to 120 people (Officers Wardroom). Even larger groups can be accommodated on deck weather permitting. For more information on holding Special Events onboard call (866) 877-6262, ext. 114. Map and Directions - For a Map and Directions to visit the ship click Here. Freedom Ferry / RiverLink Ferry - The ship is accessible from Pennsylvania via a Ferry across the Delaware River. For a link to their website to check hours of operation and other information click Here. If you're planning to visit the USS New Jersey you won't want to miss the other two Naval Warship Museums located directly across the river from the Battleship at Penn's Landing. Anchored there are USS Olympia (C-6, a Cruiser which served as Commodore George Dewey's flagship during the Battle of Manila Bay on May 1, 1898) and USS Becuna (SS-319, a Balao Class Submarine, veteran of five wartime patrols while serving with the U.S. Seventh Fleet in the Pacific during World War II). Both ships are open to the public for tours. For more information on visiting these ships while you're in the area call the Independence Seaport Museum at (215) 925-5439 or visit their website by clicking on this link Philadelphia Seaport Museum.